The Sixth Floor Museum at Dealey Plaza, located on the historical site of the Texas School Book Depository building in Dallas, TX, records and explores the assassination of President John F Kennedy within the context of today’s culture. The permanent exhibit JFK and the Memory of a Nation chronicles the history of the November 1963 assassination. Visitors are guided through the crime scene by way of evidential artifacts, photographs, news clippings, and objective historical analysis. The exhibit is divided into several areas of focus. The tour begins with a look at the 1960s, the political and social movements of the time, and the impact of John F Kennedy’s presidency. The Corner Window recreates the book depository crime scene, which was the central part of the investigation into JFK’s assassination. Interactive touch-screen displays educate visitors with a unique perspective. The Crisis Hours shows visitors what took place in the initial 45 minutes after the shots were fired. Artifacts from the Book Depository, the Dallas Police Department where Lee Harvey Oswald was shot by nightclub owner Jack Ruby, and the camera of Bob Jackson, the Dallas Times Herald photographer who took the Pulitzer Prize winning photo of the shooting, are all included here. Videos explore both the results of the final investigation by the FBI and the legacy and continuing impact of the JFK Presidency. At the end of the exhibit, visitors are encouraged to leave an entry in the memory books, sharing with others where they were on November 22, 1963, when they heard the news, and how it impacted their lives. These memories are recorded in the institutional archives and collectively offer an understanding of the culture of the 1960s and how those who lived through that time recall it today. The memory books may also be viewed and signed online. The reading room on the first floor of the Book Depository is associated with the museum and houses over 50,000 items related to JFK’s presidency, assassination and legacy. Collections of the reading room include oral histories, photographs, and artifacts as well as news clippings, television, and radio broadcasts. Popular items include artifacts related to the FBI and Warren Commission’s 1964 investigation, home movies from JFK’s childhood, and historical footage of his visit to Dallas. The Texas School Book Depository was built in 1901, and in the 1930s was incorporated into the surrounding Dealey Plaza. In 1963, evidence suggests that shots were fired from the 6th floor of the book depository as then-President John F Kennedy’s motorcade drove past the building. An employee of the depository, Lee Harvey Oswald, was charged with the murder of the president. Dealey Plaza became a National Historical Landmark District in 1993. Today, the mission of the Sixth Floor Museum is to chronicle the assassination of President John F Kennedy. An audio guide of the permanent exhibits is available. The audio-guide is narrated by Pierce Allman, the first reporter to broadcast from the Book Depository on the day of the president’s assassination. 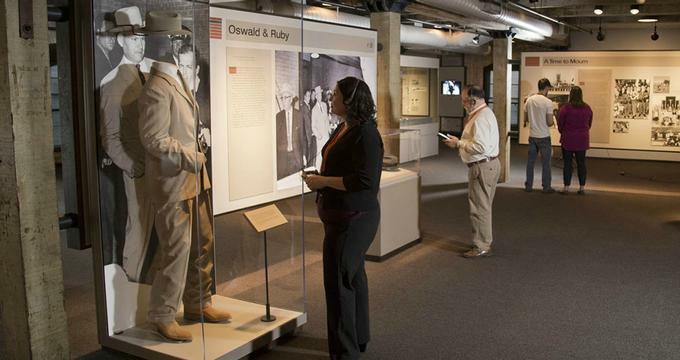 Public programs allow visitors to discuss more deeply specific aspects of the museum and the assassination. Programming has included interviews and discussions with conspiracy theory experts, discussions on the application of today’s technology to the 1963 crime scene, and an examination of the creation of the Bill of Rights, with special emphasis on the First Amendment. Programming is frequently scheduled to coincide with special exhibits and allow for deeper reflections on the material presented. Discounted tours are available for school groups and others of 20 or more, and include a 90-minute multimedia audio tour guide. Group tours must be scheduled at least two weeks in advance. While the 6th floor houses the permanent exhibit, the 7th floor of the building is home to rotating special exhibits. The focus of the special exhibits is to explore not only the assassination, but also the life and legacy of John F Kennedy. Photomosaics by the artist Alex Guofang Cao are currently on display. These large-scale photographic portraits of JFK are made from up to 50,000 smaller photographs. One explores the relationship between JFK and his wife, Jacqueline Bouvier Kennedy, by constructing his portrait out of photographs of her. Another JFK portrait is constructed from photos of significant events in his lifetime. Visitors to the Sixth Floor Museum may also be interested in visiting the famed Grassy Knoll of Dealey Plaza and the John F Kennedy Memorial, which are both just a short walk away.